Other machines can connect to the Internet; but I cannot access the web (Server Not Found error on browser and ping: unknown host google.com as result of $ ping google.com in terminal), except after doing disconnecting/re-connecting network cable. But this way only works for a short time, a few seconds up to 2 minutes. 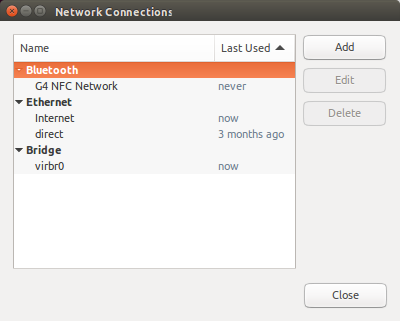 Meanwhile, my Android device can connect to the web continuously without any problem through WiFi. I tried connecting my machine directly to the modem and even changed the network (Ethernet) cable. But result was the same. What causes this problem and how I can solve it? I can open 192.168.1.1 from my machine but cannot login; although it is possible to do that from my other machines. I think virbr0 must be created and used by VirtualBox. I use VirtualBox 5.1.38. Also sometimes I can access the web without any problem from my guest OS, during time that I cannot do that from host! But I created guests along time ago, for example 2 or 3 monthes ago, and this problem occurred only this week. 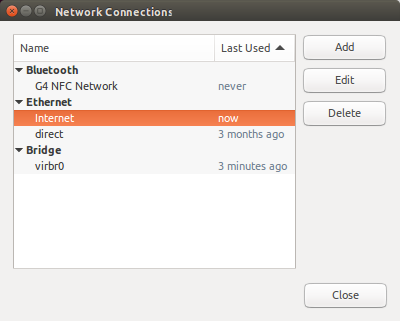 Also I tethered my machine to an Android device and could access the web without any problem. I could connect to Internet in guest session without any problem, so it seems that problem only occurs on my current account and I'm sure NIC does not cause this problem. The fact that your problem is intermittent indicates to me a very few possibilities when taking into consideration all the facts as you have presented them. The switch isn't the problem as bypassing it doesn't resolve the issue. 1) Intermittent short in the Ethernet cable. Replace with new cable. 3) Failing modem (specifically the Ethernet port). Replace modem or obtain a cheap WiFi adaptor and use that to connect since Wifi is stable. All of these possible solutions are extremely cost effective. Edit: If you determine that your problem is not hardware related and think that it's caused by something ill advised you did to your profile due to other accounts working properly you can confirm whether this is indeed the case by repairing your profile. Not the answer you're looking for? Browse other questions tagged 16.04 networking virtualbox internet modem or ask your own question. How Linux Host can access guest's sharing network on Virtualbox?